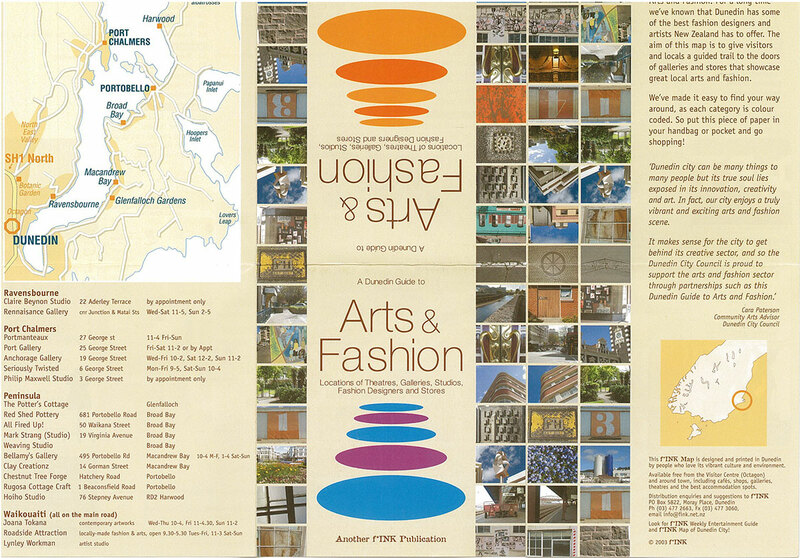 The follow-up map to the successful Arts & Fashion Map, this map was widely used for many years. Design by Aimee Glensor. 10,000 printed and distributed. 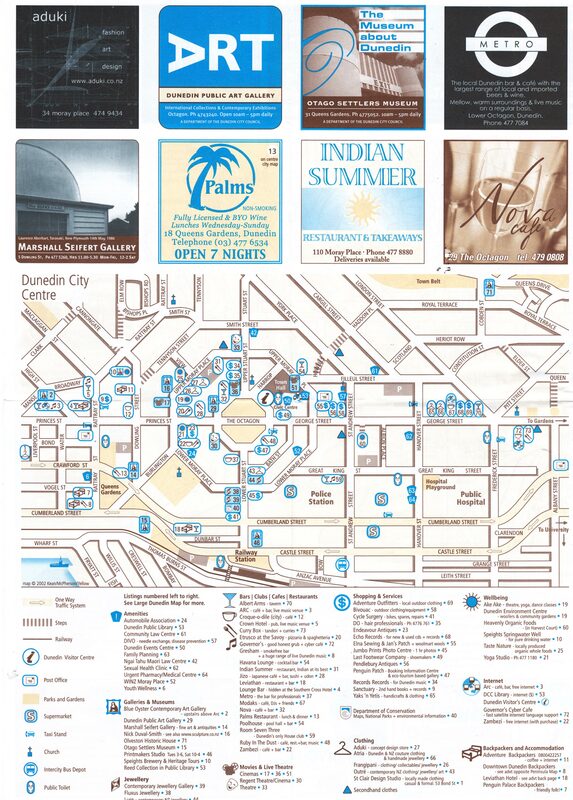 This was my first map of arts galleries and fashion stores in Dunedin. There was a great response to this little map. The map folded down to just 95mm x 100mm, the right size for 'pocket or purse'. 10,000 printed and distributed. 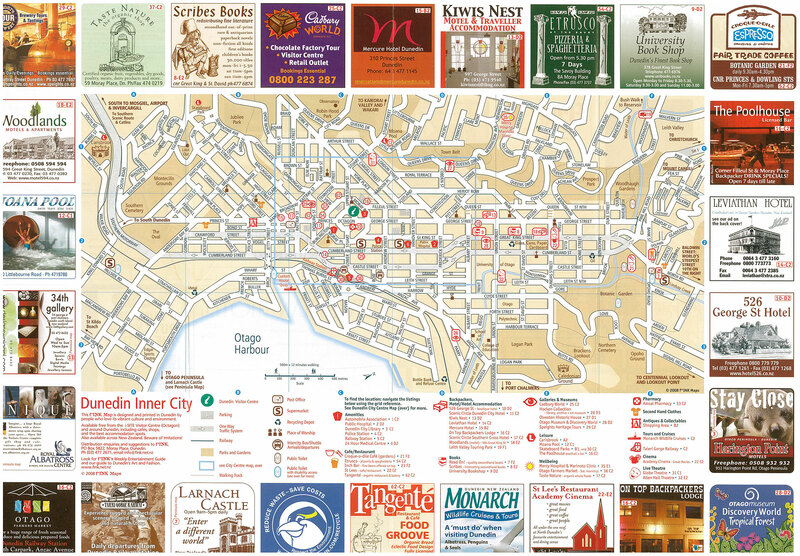 A3 double-sided map of Dunedin and areas, printed by Southern Colour Print. 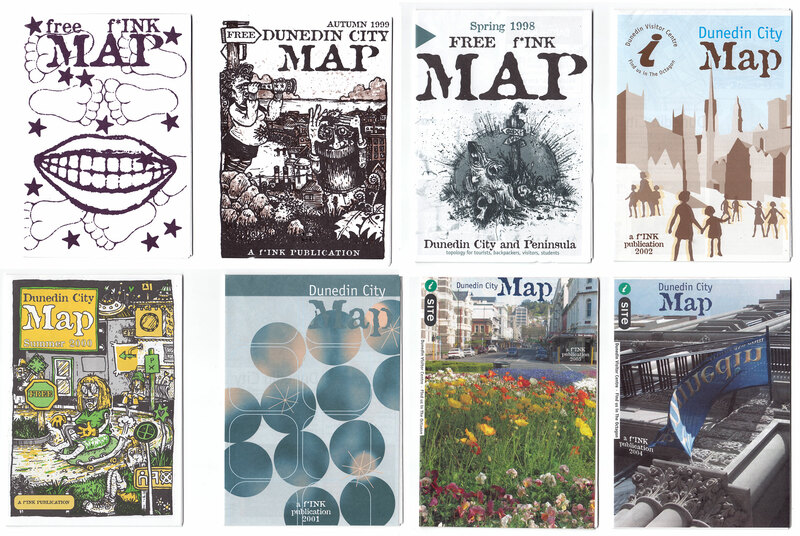 This map was designed and printed in Dunedin by people who love its vibrant culture and environment. Principal researcher was Donald McPherson. This map was subsequently copied by local map makers. 120,000 copies printed and distributed around Dunedin and Otago. Notice the custom icons that were lovingly selected and designed by Martin and Donald. Notice also the surf beaches and diving spots, second-hand clothes shops, 'Leisure' and 'Wellbeing' categories. 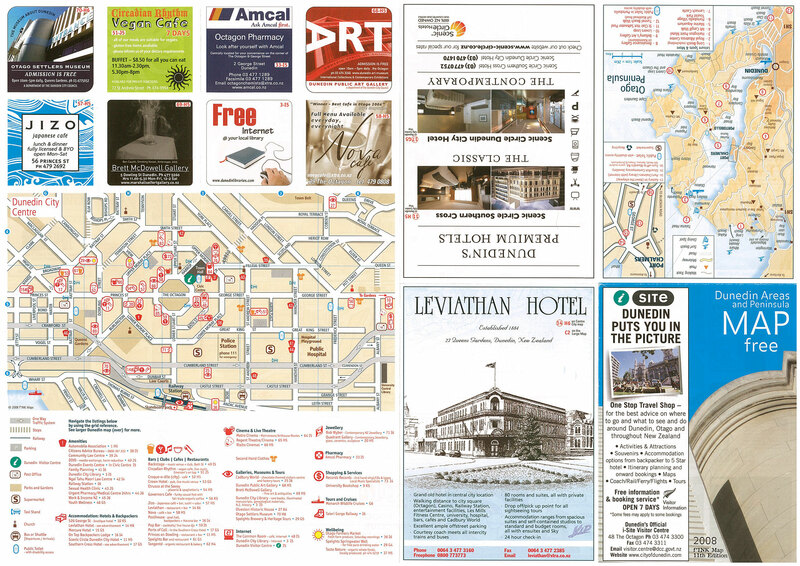 Various map front covers from 1997 to 2005. All of the hand-drawn map covers by Stefan Neville. View hisbiographyandlist of comics and drawing. 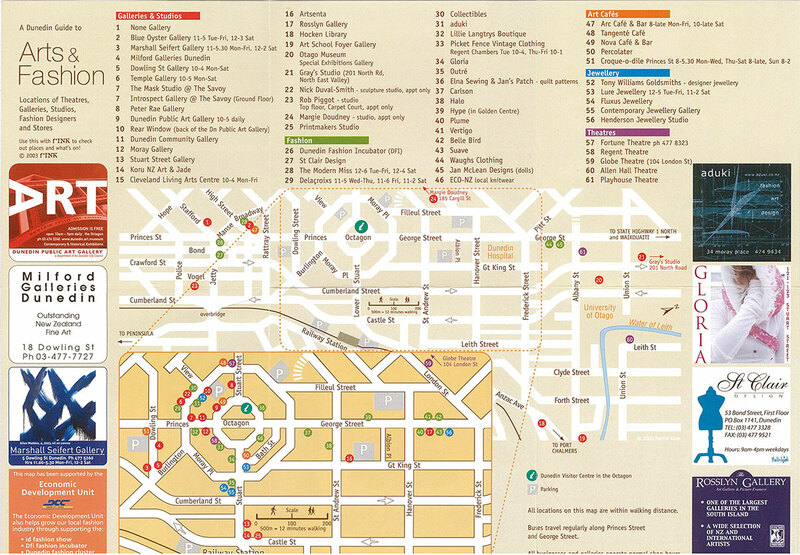 This 2002 f*INK map was printed using four spot colours: cyan, cream, brown, and dark blue. It would have been easier for us (and the printers) to print process colours (cmyk), but we liked the quality the spot separations gave. Film and plate preparation by Hughes Lithographics. Printing by Tablet Colour Print. Such amazingly friendly and helpful people to work with in each of these companies. The extensive use of icons was probably a bit over the top. Donald McPherson contributed extensively to this edition, tramping the streets to check names, climbing steps to see where led to. Donald was a Dunedin musician, who tragically died in 2017. View hispage on Bandcampandbuy his music!